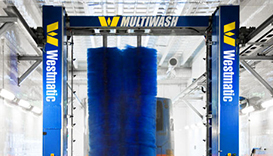 Westmatic's state-of-the-art rollover large vehicle wash systems are the ideal machines for washing public or private fleets where brushes will safely and effectively clean many types of vehicles. The brushes will intelligently wash around mirrors and other vehicle protrusions and can be installed in most existing wash bays. 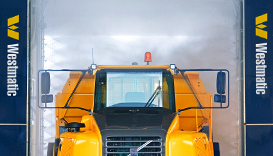 Our rollover wash system is capable of washing an entire fleet of different types of vehicles. The rollover system is available in three different styles: A 2-Brush option, a 3-Brush Multiwash option, and the HEAVY DUTY 3-Brush option, which washes with brushes, in a touchless mode, or in combination. The rollover wash system is very easy to customize for different vehicle types and sizes. Westmatic's rollover vehicle wash system is often used for fleets comprised of school buses, transit buses, motorcoach, tractor-trailers, straight trucks, and heavy equipment. Whether operating a private fleet or a retail location, the Westmatic rollover will provide a brilliant wash result, while maintaining a low cost of operation. The top brush and vertical side brushes on the Westmatic rollover intelligently wash around mirrors and other vehicle protrusions. Our vertical brushes are capable of not only washing the front and rear but sides as well. Our automated vehicle sizing/contouring system controls the brushes so that they can safely clean vehicles of all different shapes and sizes. 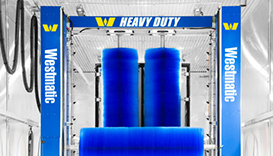 The Westmatic HEAVY DUTY is the most versatile vehicle wash system on today's market by washing with brushes, in a touchless mode, or in combination. Westmatic's rollover system will use less water, chemicals, and electricity compared to traditional systems. In terms of saving water, our high-pressure nozzles and pumps are designed to deliver as little water as possible at the needed pressure in order to provide clean wash results. Use up to 50% less water and get up to 99% water purity. Equipped with the latest PLC technology, Westmatic's wash systems incorporate the most advanced programming and unsurpassed control. All aspects of the system are constantly monitored and adjusted, ensuring the safest and most consistent results. Each system comes standard with an LCD touchscreen wash program selector, and step-by-step self-diagnostics and troubleshooting. Westmatic is also capable of wireless remoting into the equipment, to help diagnose and program. With all of their sophistication, Westmatic's equipment remains very simple to operate and maintain. 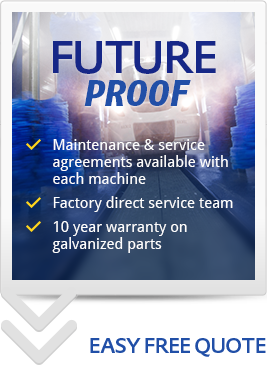 Our systems require less than 30 minutes of preventative maintenance and mechanical adjustments per month. Equipment is very easy to customize for various fleet configurations and budgets. If you have any questions about our Rollover Wash Systems, please fill out the form and someone will be in touch with you as soon as possible.